When the children bring home plants from school, I always seem to kill them after a while, I give them too much or too little water! I have heard of 'repotting' the plants to the garden, but by the time I remember, the plants are long gone :) I have always loved the beauty of nature, so when I found this shelf at a local vintage shop, I thought I could use it to display a little plant collection. 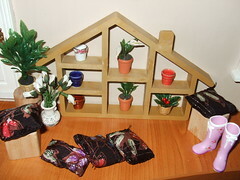 The wellies are re-ment, the cushions are handmade.